Oh, we feel so sorry for our poor tomato plants. They have a hard life in this climate. During the dry season we choose a few to water with our kitchen greywater, but aphids become a problem. During the rainy season they tend to rot, so this year we planted several of them in pots that we can move in and out of the rain to protect them from too much water. And then the hornworm showed up. At first we thought, “How pretty!” and snapped a few pictures and let it be. Then we looked the worm up and found that it is the culprit that has eaten the first 4 signs of fruit on our Oaxacan tomato plants! 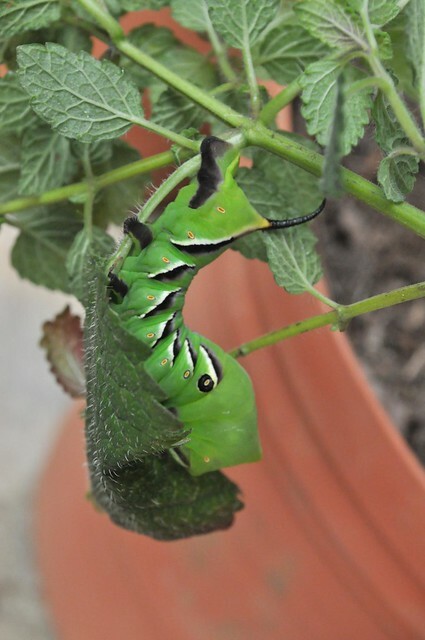 We will be on the lookout for more of these little buggers and try to get some yield this year from our tomato plants. We are not planning on using any chemical control to get rid of them, however they will be great food for our chickens! Hopefully some of the local birds will come help us out as well. Hornworms are notoriously difficult to find since their green color matches the plants, but they glow under black light. At night we can use a black light flashlight to easily spot them and remove them from our tomatoes. You are currently browsing the News and thoughts from the Bosque Village weblog archives for August, 2010.